Love this big pendant necklace on Sharon Stone. Actually I love this entire look on her. So elegant! Source. As I spent the summer pouring over three jewelry books, Amazing Cartier: Jewelry Design since 1937 by Nadine Coleno, Set in Style: The Jewelry of Van Cleef & Arpels by Sarah Coffin, Suzy Menkes, and Ruth Peltason, and Elizabeth Taylor: My Love Affair with Jewelry, I noticed a shift happening in how I think about big jewelry. When I was younger (in my twenties and thirties), I gravitated toward more delicate pieces, although as a teenager I did love big earrings. I do still like smaller pieces of fine jewelry—I love my amethyst and diamond pendant, my diamond stud earrings, my sapphire and diamond eternity ring, all of which are small. I think because they add just the right amount of sparkle and shine, as well as the fact that they are precious metals and gemstones, I wear them all very regularly. They are part of my everyday look. Tiny but wonderful: An amethyst and diamond pendant. Liz in her Cartier ruby and diamond necklace and earrings from Mike Todd. Of course, who but Liz Taylor could have a gigantic ruby and diamond Cartier necklace, like this one she received from Mike Todd, so obviously most of the big jewels anybody owns are costume, but with that differential out of the way, do you like delicate or big jewels and have your ideas about the two changed as you have gotten older? Love wearing this big Duchess Jewels necklace. Talk about sparkle and shine! Somebody, I can’t remember who, maybe my mother (although if it was one of you lovely readers, let me know in the comments), said I’d want to wear big jewelry when I got older, because the small stuff would get lost in the wrinkles. Ha! A larger piece I am loving is my new Jacket Society tassel necklace. I am wearing some of my larger necklaces more frequently and really liking the look. I don’t know that I would go any bigger, maybe I will with time. I feel like really big jewelry would just overwhelm my frame but maybe in ten years I am only going to want to wear the biggest stuff possible. I really loved the entire ensemble on Sharon Stone, above, that she recently wore in Italy—loved the red dress, gold high heels, the scarf in her hand, and that exquisite pendant necklace. She is 57. I think she looks terrific and I think I’d be happy to try that pendant necklace on for size, as well as her gold watch, which I do believe is Cartier! Anna at the US Open in her stacked collet necklaces. Photo by M. Stockman. 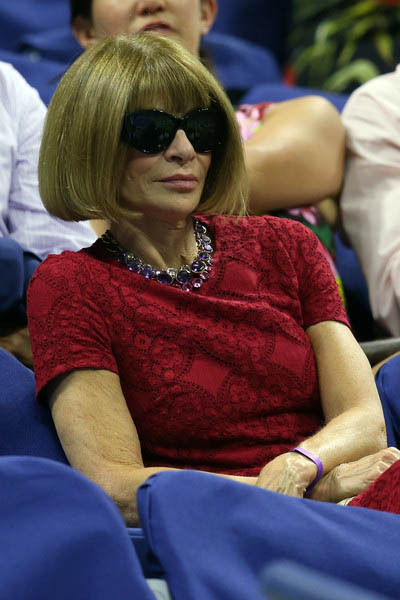 Anna Wintour is known for her gemstone collet necklaces, which are pretty big, and she wears them in stacks too, but you don’t see her with a whole lot of other jewelry on. In dream pieces, I would not say no to this substantial Van Cleef & Arpels Fifth Avenue Magic Alhambra 16-motif necklace in white gold, with onyx and pavé motifs. Gorgeous! 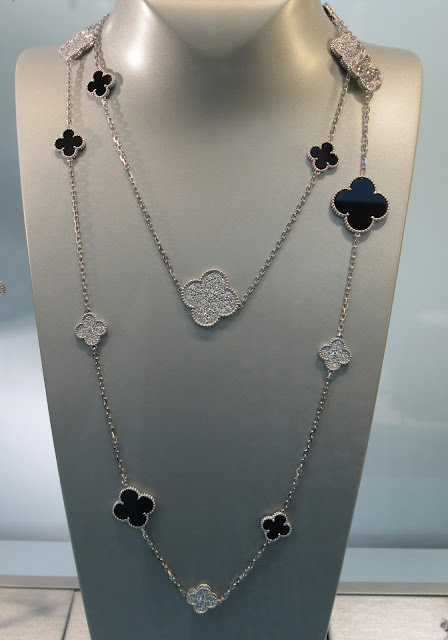 Love this mix of large and small on a VCA Magic Alhambra 16-motif necklace. I recently visited with my 91-year old grandmother. She wears jewelry everyday. And what does she wear? Small gold hoops. Small pendant necklaces. A slender watch. The diamonds in her wedding ring are a nice size and I love that she has her Liz Taylor moment every single day by wearing that diamond ring. (And she laughed when I told her this, btw.). But it was interesting to me that a lady in her 90s still wears small simple pieces. Perhaps my tendency to like smaller (fine) jewelry is hereditary? Not too big, not too small, just right: A ring of dark tanzanite and diamonds in rose gold. Let me know if your taste in the size of jewelry, whether fine or costume, has changed over the years. Were you always a big jewelry gal but now like smaller pieces? Or vice versa? Or do you keep the everyday jewelry small, whether it’s fine or faux, and break out bigger pieces for nighttime events? I would love to hear your thoughts on this topic! I have definitely changed my way of wearing jewellery. When I was younger I wore delicate and real pieces now I wear statement and definitely not real. If I wear the smaller pieces I often stack them. The older I get, the bigger I want the jewelry, and costume pieces are fine. Stacking is a great way to create the 'look' of larger pieces--rings. bracelets, necklaces (a la Anna's multiple collett pieces). Small, fine. The only thing I do differently now is a chandelier earring, vs. a small post or hoop. And the chandeliers are still semi-precious vs. costume, because a) I'm allergic to metals except 14K+ gold and b) brought up that way? I do not think I will ever wear a "statement necklace" unless I'm going to a gala or some sort or another. Which, not too often;). Except for earrings, I like my jewelry big. The earrings are getting smaller as I grow older, I just wear my diamond studs now. But I adore big necklaces, bracelets, rings and watches. Not all at once though, lol. When I was youmger, I rarely wore big jewelry. Even when earrings were BIG in the 80's & 90's I didn't wear them. Now, since my clothing tends to be knits, have very clean lines, no prints (except stripes) I need some more oomph. Statement necklaces, big bangles & interesting earrings brings my outfits together. Of course, not all at the same time. Alexis Bittar necklaces really stand out. I also love stacking smaller bracelets, or layering non-statement necklaces (most of this jewelry is from the past). :-) I like vintage jewelry for every day, as I feel it goes with everything. But I have taken a liking to big necklaces or big pendants. They don't have to be silver or gold. They can be colorful and made of leather and plastic or whatever - just something that adds fun to an outfit. Have a very HAPPY week, Jill! Hi Naomi, what an interesting thought, that jewelry size is not about age at all! I know what you mean re the big necklace--I saw this young gal wearing one today, it was pretty big, vibrant dark pink tassels (! ), several of them, close to her neck. It totally worked on her and I stopped her on the street to tell her how great she looked. But I think plenty of people would NOT be able to pull off that necklace, no matter the age.